Hey there! Thanks for dropping by News & Reveiws! Take a look around and grab the RSS feed to stay updated. See you around! 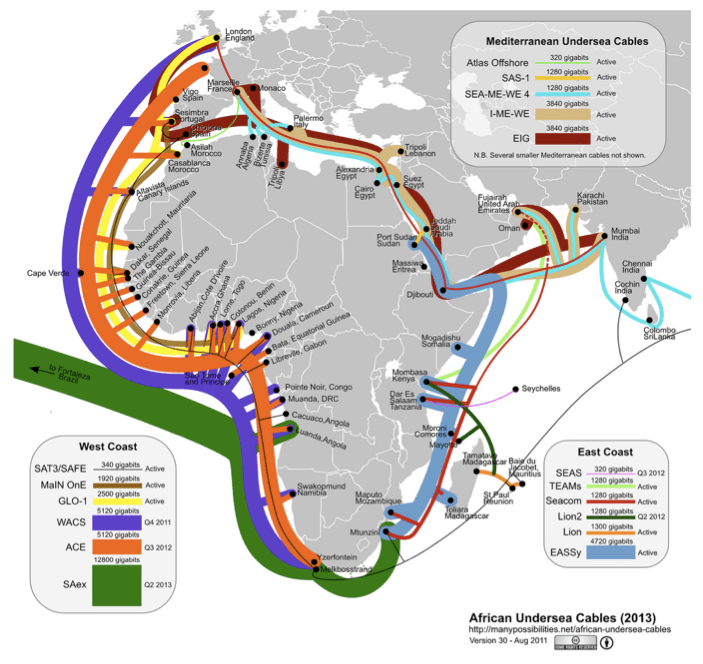 Google’s Sub-Saharan Africa office is funding a project by Steve Song to create a comprehensive map of all terrestrial broadband fibre-optic cables in Africa. Using crowdsourcing methods and contacts within the ICT4D space, Song is spearheading an effort to convince governments and telecoms that it is in their own interests to make public where they have laid terrestrial broadband cables. The project is named AfTerFibre (Africa’s Terrestrial Fibres). AfTerFibre, which started in June, is currently building its network of contacts, engaging governments and telecoms in conversation regarding the location of their cables. In an effort to be as public and open as possible, Song has organized a public google group to collect the information. As the group makes agreements and collects data, they will incrementally publish an updated map of Africa’s terrestrial cables, hopefully one about every two months. Then, next summer, they hope to publish the completed map. “We hope that the map is more than just a reference tool, but a sign of inspiration. When you see all the connectivity in the region, you can’t help but feel that something is about to happen,” Song said. Presently, most operators in Africa are not publicly announcing the location of their cables, so people don’t know where they are. Song’s goal is to convince operators that they stand to benefit by releasing this information to the public, just as the operators arguably have after Song published the undersea cables map. Some operators have been skeptical about publishing the exact location of their cables, for fear of someone cutting them. Song assured the operators that the map will not be absolutely accurate, but simply accurate enough to spawn additional connectivity to previously unconnected areas. “So you won’t be able to locate the cables like you would locate a restaurant on your smart phone,” Song explains, but you will be able to locate the general area so that as a business or a local government you can make an educated estimate about how far you are to a connection. Jeffrey Swindle is a researcher for Global Broadband and Innovations (GBI), a USAID-funded program that provides technical assistance to narrow the digital divide by expanding connectivity and supporting the delivery of socio-economic impacting applications through this expansion. He is also a graduate student at the University of Cambridge, Development Studies and can be found on twitter at @Jeffswin.